Dylan was born in Newport on the Isle of Wight. In 1992 he left the Island to study for a BMus (Hons) in Music at Goldsmiths’ College, University of London. After graduation, Dylan worked for 2 years with train operator GNER, based between King’s Cross and Retford. This was followed by 8 years with the Civil Service in London. His Civil Service careers culminated with 3 years’ training staff from across the globe to help them better assist UK business to enter overseas markets. Whilst with the Civil Service, Dylan conducted the Foreign and Commonwealth Office Choir for 3 years. The highlight of this role involved organising 2 concerts (one in London and one in Paris) to celebrate the centenary of the Entente Cordiale between the UK and France. In 2006, having been recommended for ordination training, Dylan moved to Cambridge to train at Westcott House and take a degree in theology through Sidney Sussex College. He was made Deacon in 2008 and ordained Priest in 2009 in Rochester. 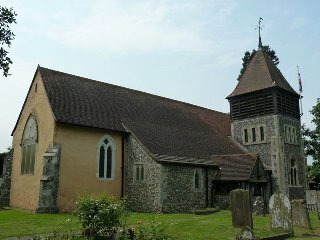 Dylan served his curacy in the Parish of St Nicholas with St Mary, Strood. In 2012, Bishop James Langstaff offered Dylan the post of Priest-in-Charge in the Parish of Longfield and Dylan was licensed on September 19th of that year. Dylan is also an Honorary Priest-Vicar at Rochester Cathedral, leading the offices of Evensong, and occasionally Matins. Singing Evensong has given Dylan a wonderful way of linking his Musical background with his developing Liturgical interests. In 2010, Dylan married Jenny. Jenny is a Doctor, currently working at Maidstone Hospital. Together they enjoy travelling, entertaining, eating out and going for country walks. Elizabeth is a Self-Supporting Minister or SSM in the RNWK Group. What does that mean? I am a full time Priest but not responsible for a particular parish, I take services and preach right across the Group. I also work as an accountant and so try to live out my faith in the business community. Combining a day job and ministry as well as family life (husband, two grown up children and four cats) means a lot of juggling, I trained part-time for three years at SEITE (now St Augustine’s College) before being ordained in 2006. It was great preparation for the undoubted tensions of living in the world but not of the world! When I’m not at work (church or accounts and tax) I really love enjoying the beauty of creation, whether a walk in the Kent countryside, from the back of a narrow boat or rambling in the Lake District. Lawrie has been a Reader [Lay Minister] for some 20 years. He was licensed to St Mary Magdalene in 2010, having serviced in neighbouring parishes which are now part of the North West Kent Rural Group. He lives in New Ash Green a village within The Group ministry. His career was spent in teaching at both secondary and primary levels. He remains a school governor and on the Rochester Board of Education. Meanwhile he loves to travel as he has family/family connections in the USA and Canada. He supports development work in Zimbabwe and Kenya, countries he has visited. Gill moved to New Barn with her husband Barry nearly 35 years ago and has been a member of the church community throughout that time, initially attending both the Longfield Mission Room and St Mary Magdalene. With her two children having attended local schools and having participated in church activities and organisations, her family life has been linked to Longfield church for many years. With her children having now married and “flown the nest”, she now enjoy spending time with them whenever she can. Gill now work as a Manager principally in the areas of Human Resources and Health & Safety but when she is not working she likes to keep fit and active and have a keen interest in gardening as well as being a joint season ticket holder in support of her favourite rugby team.